Back in college, I used to spend a lot of my time (and money) perusing the local Japanese supermarket in the Sawtelle / Little Osaka area. Some grocery shopping trips would yield a cornucopia of fresh ingredients like enoki mushrooms and sashimi grade salmon, and others would be geared toward restocking my pantry with staples like furikake and yakisoba. Among the latter would always be a box of Japanese curry mix. Heavily seasoned blocks of curry roux, these were essential to making a hearty meal in the dead of winter when I was too busy studying to truly make something from scratch. Nowadays, I still keep a box or two around for weeknight meals that appear impressive with minimal effort. 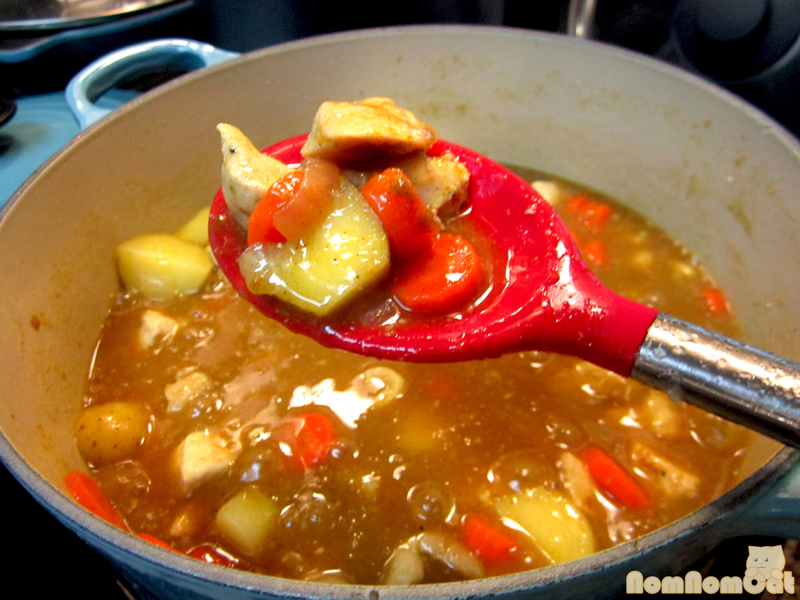 Japanese curry roux generally comes in three levels — mild, medium hot, and hot/spicy. There is also a variety of brands available depending on your area and grocery store. 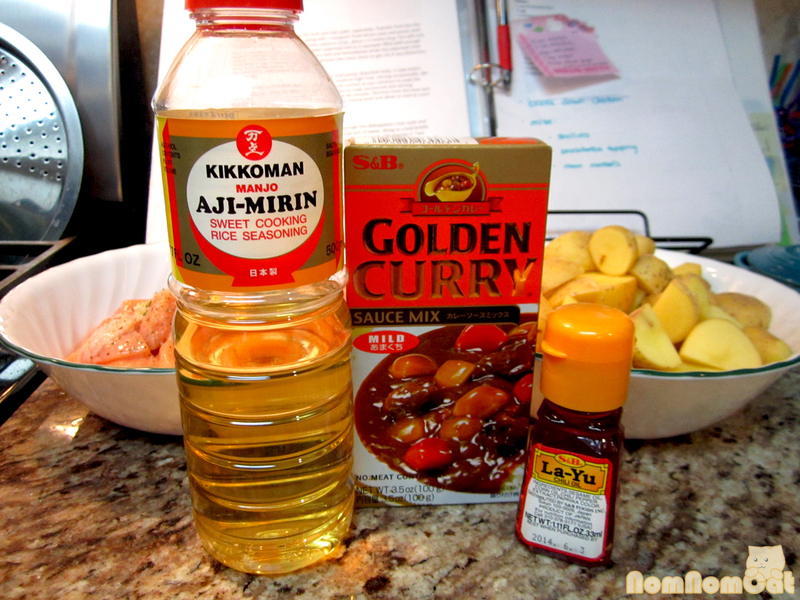 Even if you are not located near an Asian supermarket, you could probably find S&B Golden Curry at your local grocery chain in the “Asian food” aisle. I prefer buying the mild kind and spicing it up with La Yu chili oil to my preference. 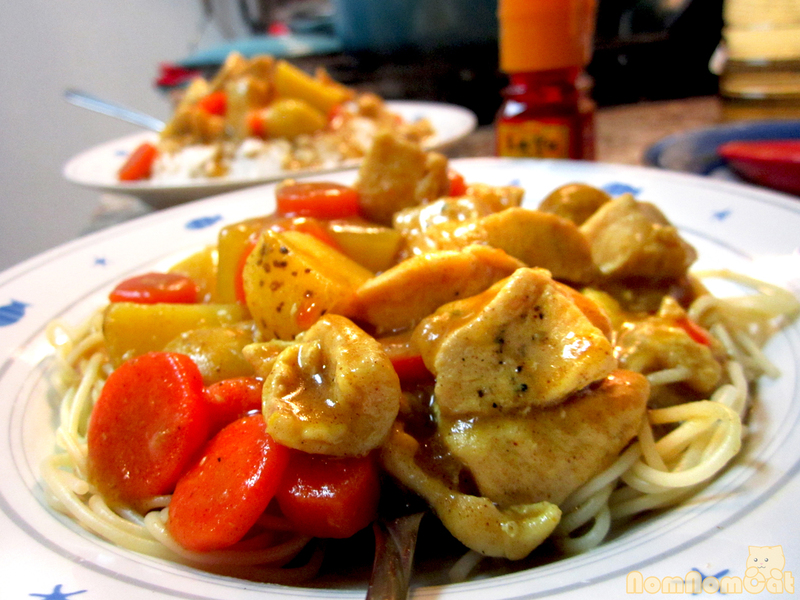 This enables you to taste the flavors of the curry mix without the spice level dominating your palate. Also, the first step (marinating the protein in mirin) is optional, but I think this sweet rice wine is ideal for bringing out that great umami flavor that sets this curry apart from your neighbor’s. 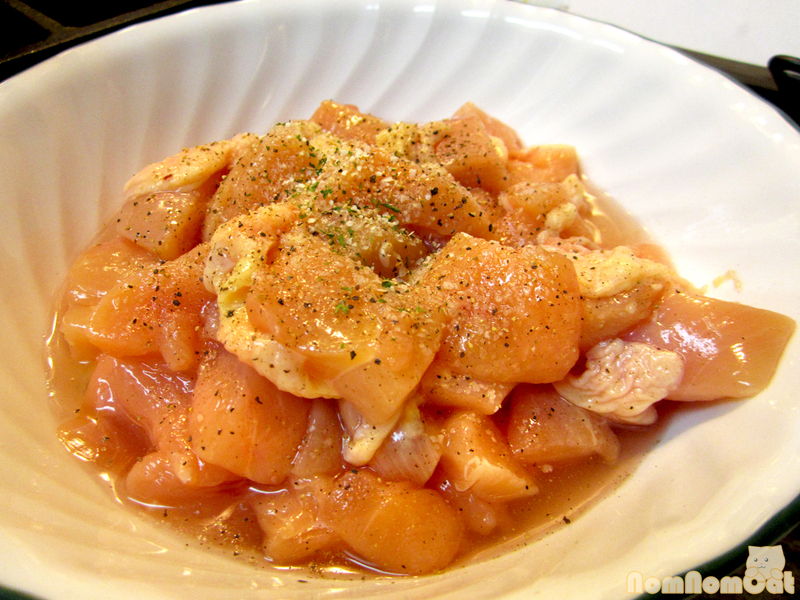 Cut up the chicken and place in a large bowl. Season with salt (or garlic salt as pictured) and black pepper and drizzle with mirin. Toss to combine and set aside. Chop the onions, potatoes, and carrots. Set aside. 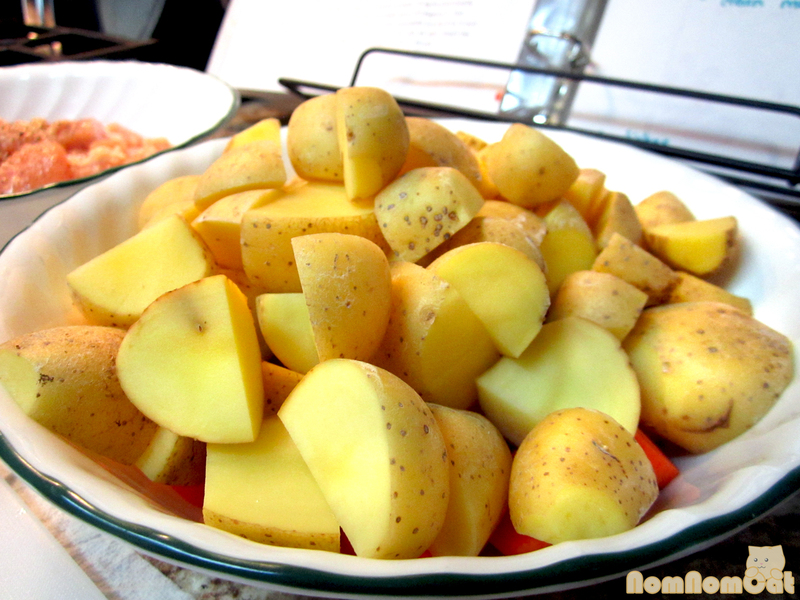 If using mini/young potatoes, you do not have to peel them. In a large pot (I used my 4.5 quart dutch oven), saute the onions in a light drizzle of oil, about 1 teaspoon, on medium heat. You want them softened and translucent but not too browned. 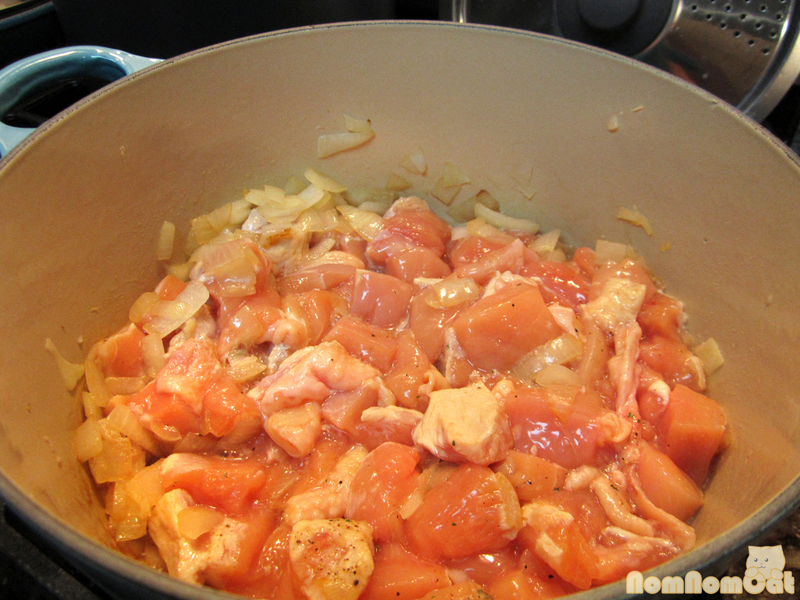 Add the chicken, mirin and all, and try to caramelize each side for added flavor. Saute for a few minutes. 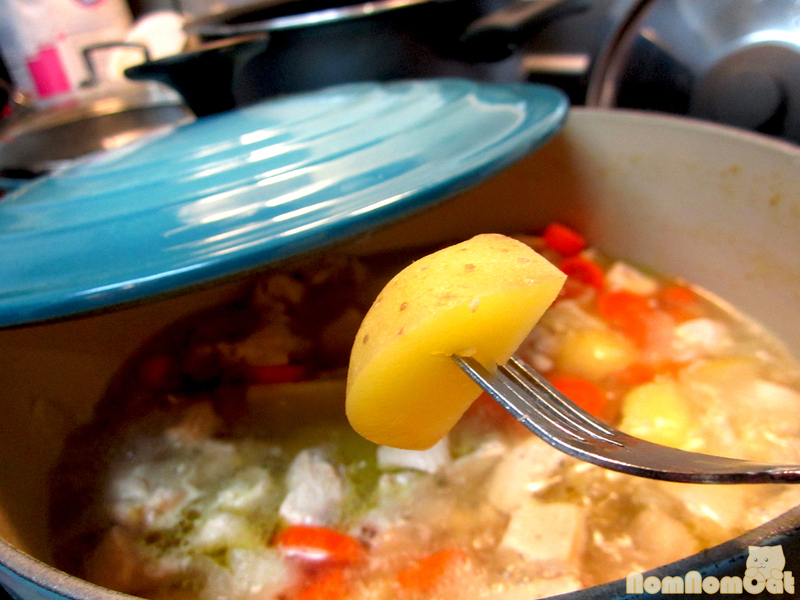 Toss in the vegetables and pour in enough water to cover. The box instructions will likely say 500 mL (about 2 cups). I added extra, but not more than 3 cups total. Bring the pot to a boil and then turn the heat down. 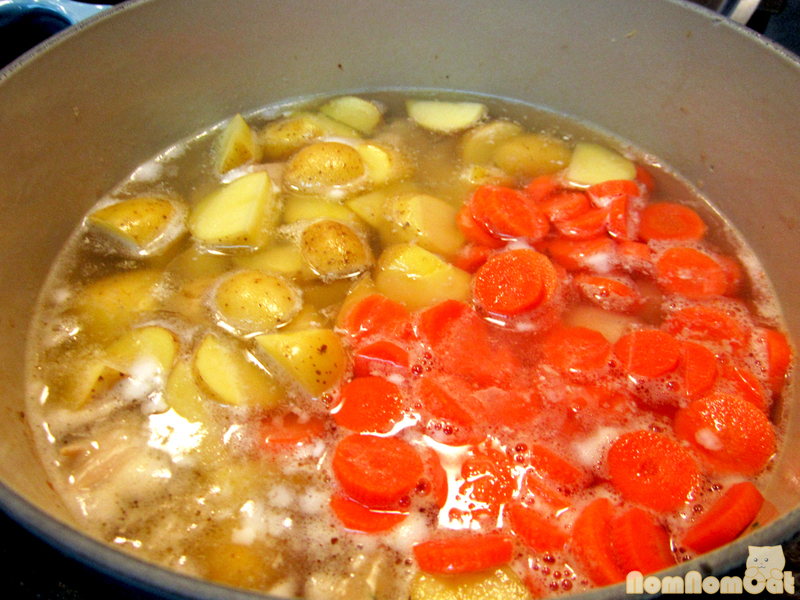 Leave it at a steady simmer until the potatoes and carrots are fork-tender, about 15 minutes. 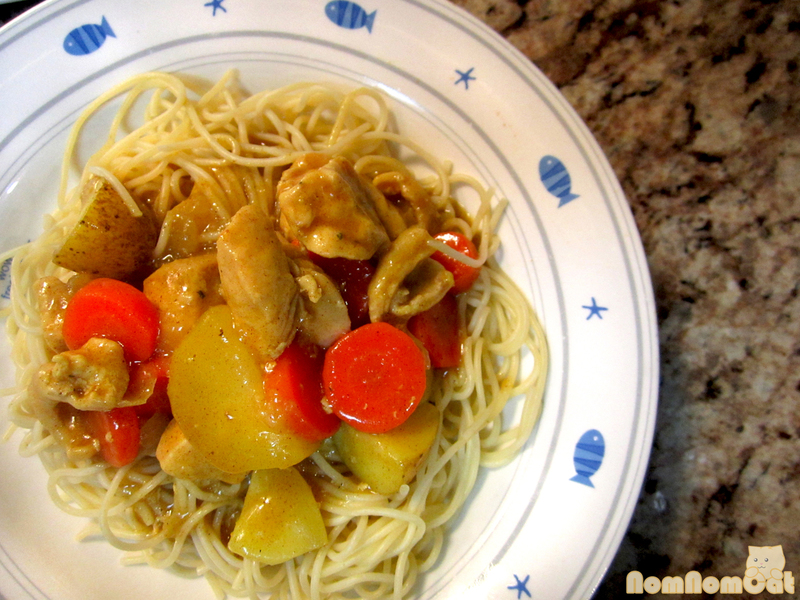 While still in the package, break up the curry roux into chunks. 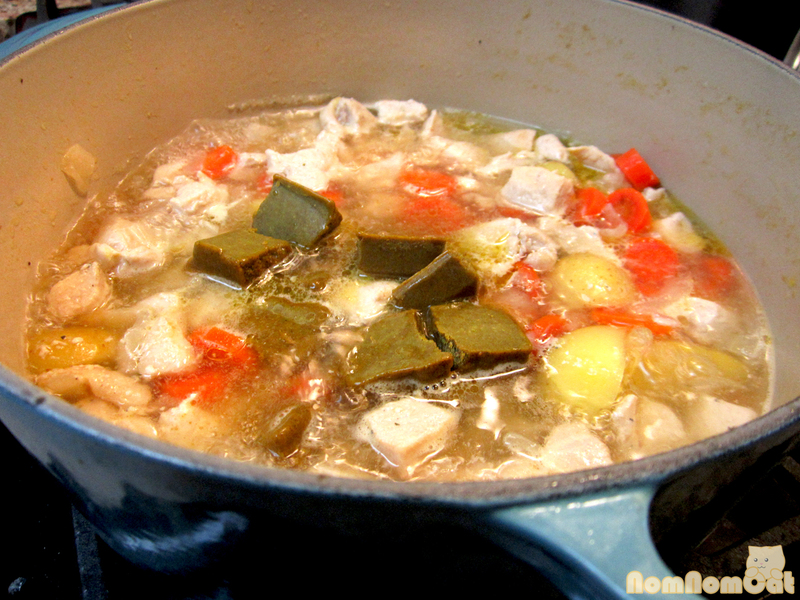 Tear open the package and add the chunks to the pot. 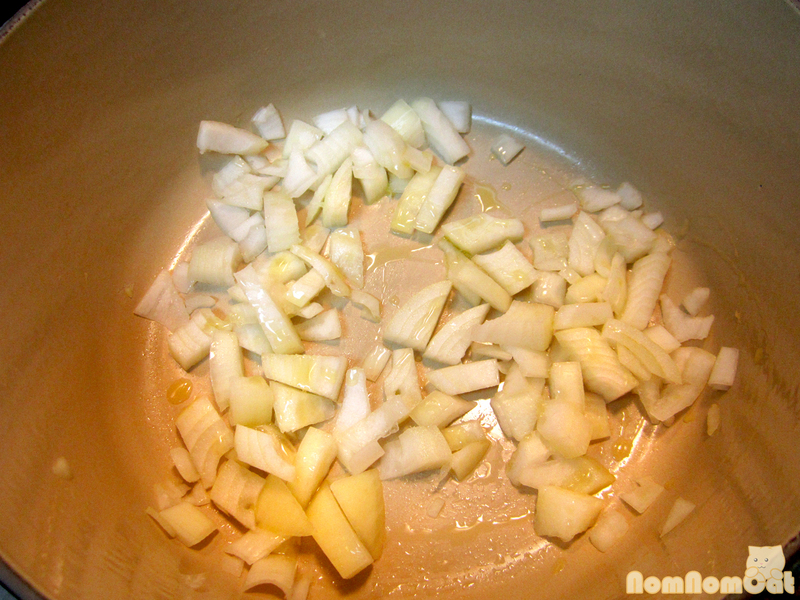 Stir well to evenly distribute and let simmer for another 5 minutes for the sauce to thicken, stirring constantly. 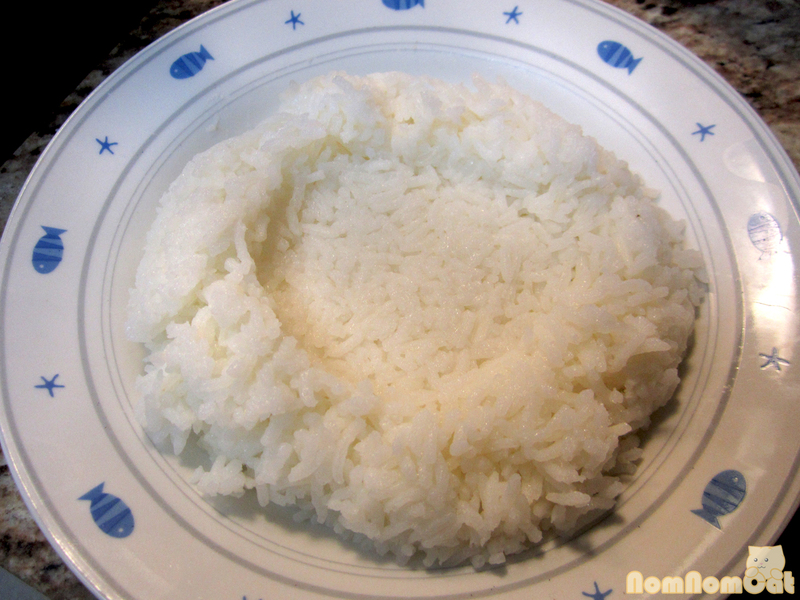 Using the paddle that you used to scoop the rice out of the rice cooker, press a small well into the center of the mound. This will hold in the “good stuff” while letting the sauce run over the sides to flavor all of the rice. Voila! 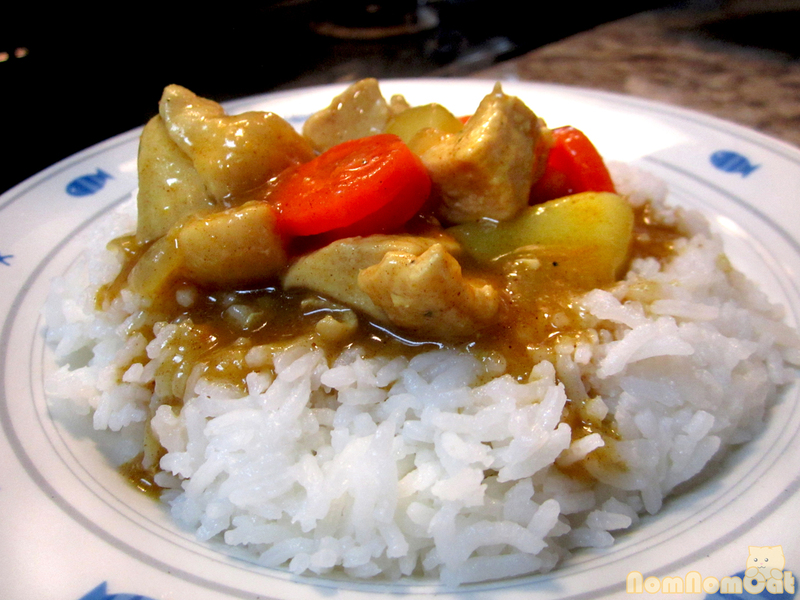 Japanese chicken curry over rice. PS: I know our posting schedule has fluctuated over the years. While I would love to continue with twice a week posts, I’ve made a (good) major life change lately that will no longer allow for me to feasibly keep up with that schedule. We appreciate your patience as we revert to our once-weekly schedule (ideally Mondays, but sometimes Tuesday or Wednesday). :) We love you, Nom Nom Cat readers! Looks delicious and I love curry.